Similar to my love for HGTV, I also love The Food Network, especially Barefoot Contessa. While her show is great (I SO want to visit Martha's Vineyard! )...I especially love her recipes and have several of her cookbooks. My husband and I have tried dozens of her recipes and are rarely disappointed. She believes in simple directions and high quality ingredients, which makes it fun and easy to replicate her recipes. 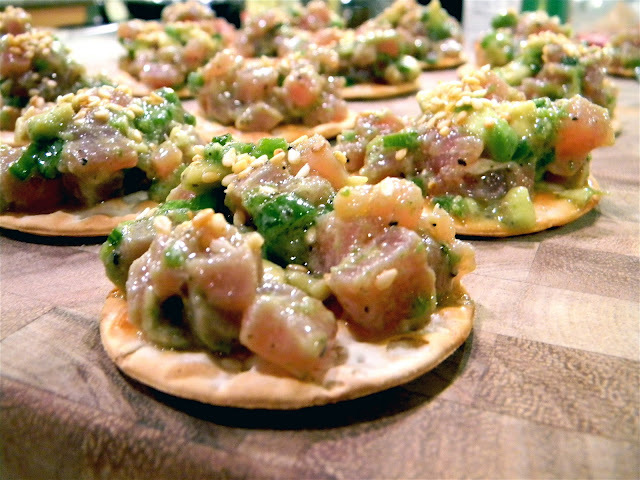 So last night, we decided to try her tuna tartare. I've recently started to really enjoy tuna and we have a great specialty market in town, Overland Meat, that flies in fresh tuna every Friday! We were really impressed with the quality and I think that makes a huge difference in the end result. Cut the tuna into 1/4-inch dice and place it in a medium bowl. In a small bowl, combine the olive oil, lime zest, lime juice, wasabi, soy sauce, Tabasco, salt, and pepper. Pour over the tuna, add the scallions and jalapeño, and mix well. (Note: we actually made the sauce first and then cut the tuna in order to prevent oxidation). Cut the avocado in half, remove the seed, and peel. Cut the avocado into 1/4-inch dice. Carefully mix the avocado into the tuna mixture. Add the toasted sesame seeds and season to taste (Note: we put these on top only). Allow the mixture to sit in the refrigerator for at least an hour for the flavors to blend. Serve on crackers (we used Carr's brand, with sesame seed flavor). We love the flavor of the sauce and will definitely make these as an appetizer for company. this looks amazing and i will def be trying this!!! i love, love, love tuna!! MrsJenB--I felt the same way you did about working with tuna, but I really do think the key is to use super fresh tuna and you're golden! And no cooking required, which is nice! Natasha this is beautiful! I'm so hungry this is making it worse lol! And thank-you for the kind comment. It meant a lot to me and really made my day. This looks delicious Natasha - and so pretty too! Love your new photo header - that must be from your wedding? Thanks so much for linking up to Tasty Tuesdays!